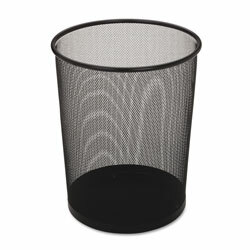 Lightweight steel mesh wastebasket features a diamond pattern and no-snag curled rim that protects clothing and furniture. Round design has a solid steel base and a baked-on epoxy finish. Wastebasket is made from 30 percent recycled material and is 100 percent recyclable. Black Indoor Trash Cans from Rubbermaid! 285 In Stock today.